IBM® QRadar® Incident Forensics reduces the time needed to investigate and respond to security incidents. It is easy to use and requires minimal training, enabling IT security teams to quickly and efficiently research security incidents. Its data collection capabilities extend beyond log events and network flows to include full packet captures, and digitally stored documents and elements. It helps provide context and visibility to the who, what, when, where and how of an attack. Includes data pivoting to help discover network relationships involved in an incident. Creates indices using network and file metadata and the payload contents of packet capture data (PCAP) including text from web pages and documents. Helps analysts filter search results to include only packets associated with a specific QRadar offense, helping them quickly and easily locate malicious traffic. Enables testing for attacks identified by internet threat intelligence feeds such as IBM X-Force®. Uses the QRadar single-console user interface with a right-click integration capability to populate a packet capture search request. Includes point-and-click tools for deeper analysis and visualization of extended relationships, or digital impressions based on IP or MAC addresses, email, chat and social media identities. Permit access to the IBM Security App Exchange. Discerning which suspicious activity is truly relevant to an incident. Identify the actions of cyber criminals to provide deep insights into the impact of an intrusion and help prevent reoccurrence. Determining the full extent of a security incident. Compile evidentiary profiles on security incidents for remediation. Rebuild data involved in a security incident to obtain a detailed, step-by-step view of the offense. Simplify the query process with an interface like an internet search engine. Forensics has been manual, required specialized tools, and needed specialized technical skills. IT security teams can quickly and easily conduct a thorough forensics investigation and gain visibility to the details behind a security breach, with no special skills or training. Having to use disparate systems and tools, and hoping you find a connection for the offense. Optionally use existing PCAP infrastructure or acquire new systems dedicated to QRadar Incident Forensics. For information about hardware and software compatibility, see the detailed system requirements in the IBM Security QRadar Incident Forensics Installation Guide. Uninterrupted Power Supply (UPS) for all systems that store data, such as QRadar Console, Event Processor components, or QRadar QFlow Collector components; Null modem cable if you want to connect the system to a serial console. QRadar products support hardware-based Redundant Array of Independent Disks (RAID) implementations, but do not support software-based RAID installations. 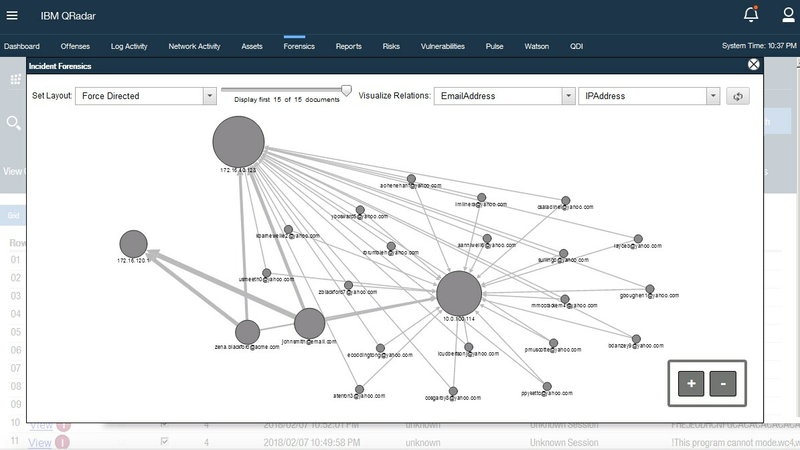 QRadar Incident Forensics is integrated into the IBM QRadar Security Intelligence Platform. For distributed installations, you can now add a QRadar Incident Forensics appliance (IBM Security QRadar Incident Forensics Processor) as a managed host to a QRadar appliance. There is no longer a primary or secondary QRadar Incident Forensics node. Each QRadar Incident Forensics processor is managed by the QRadar console.